Morning came quick and I got on the road quickly. The drive from home to Brockway was just over three and a half hours. I drove through flooded back roads as I left town and was looking forward to the forecast of warm sunshine just a few hours northwest. I had far too much caffeine in my system by the time I was turning off of Rt. 28 onto 7thAvenue. I saw the Little Toby Creek to my left and the road turned from paved to gravel fairly quickly. Most of the structures in the area appeared to be summer cottages or hunting camps. The view was beautiful and I was looking forward to catching brookies in the surrounding forest. I finally came up on my first GPS marker at Jenkins Run and what I found was disappointing. Aside from a deep pool below the small bridge, the summer months had reduced Jenkins Run to nothing but a small trickle off of the mountainside. Were there brookies in there? I’m sure there were fish in there but they were probably hiding under rocks in two inches of water waiting for the next rain to survive. The contrast between the water here and back home was dramatic. Disappointed, I was glad I had that back-up stream. Always have a back-up stream. I continued driving north on 7thAvenue and only about a mile from where Vineyard Run was supposed to cross the road, the road stopped. It ended in a turnaround and then it was just woods. I don’t understand why Google Maps makes these types of errors. Apparently the road picks up somewhere further north. The problem was that I had no GPS connection to reroute. Suddenly I found myself with no stream to fish and no directions to a third option. This isn’t the first time this has happened. My iPhone showed my position in Google Maps so I was able to at least navigate roads with no names displayed. I drove back the way I came until I got back to Brockway. I found a small gas station and was able to pick-up a faint cellular signal. I remembered that when I was looking at Allegheny National Forest I’d come across another surveyed trout stream called Irwin Run, which flowed into the Clarion River. I knew it was going to be another 45 minutes to get there but I figured if it was low, I could continue driving into the National Forest where there were many brookie streams. I drove up Rt. 219 and at Ridgway headed west on Rt. 949. I had set my marker at the Irwin Canoe Launch, which sits at the intersection of Hallton-Spring Creek Road and Irwin Run Road. There’s a nice parking lot there with a portable toilet. The only problem is if you try and park there in the summer, the lot is typically packed with canoe and tuber drop-off vehicles. Fortunately as I was pulling in, another guy was pulling out and I had a spot right up front. People looked at me inquisitively as I was pulling waders on in the warm weather. I rigged up my 8’-4wt G-Loomis rod and Hatch 3-Plus reel with a 7-1/2’ 6X leader and a small section of 6X tippet that I ran to a #14 Royal Wolff dry fly pattern that was tied with purple thread and a flash wrap on the body. I grabbed my water bottle and ducked down into the stream and walked under the bridge. Portions of Irwin Run were low and rocky and difficult to fish. The first hundred yards was not a desirable area to fish. However, as soon as the stream headed away from the road, I walked up on a beautiful deep pool with a waterfall dumping cool spring water into it. Surely this had to hold my first Allegheny National Forest wild brook trout. I got set-up and put a couple of casts on the left side of the pool. No luck. I placed a cast right at the base of the waterfall and as my dry fly popped out of the turbulent water, a brook trout rose and made a splash as it grabbed by fly. It was a beautiful thing to observe. I brought the fish to my net and watched him for a bit before releasing him back into the cool tributary water. 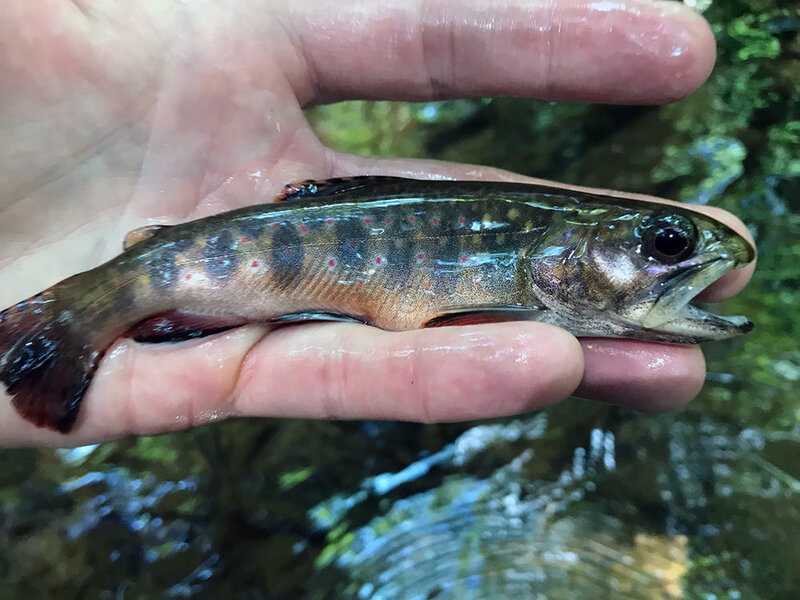 The first brook trout I caught in the Allegheny National Forest on Irwin Run. I started working my way upstream. Irwin Run was at summer flows and varied in its look from narrow rock filled runs to large glassy pools with little to no current. On several occasions I cast my fly and watched a small brook trout attempt to eat a fly and hook too large for its mouth. I also had several fish on the hook for a few seconds, only to have the hook fall out of the fish’s mouth. It was tough. By lunch time I’d only landed a couple of fish and had missed four times that. The further I made my way upstream, the narrower the stream became. I passed several springs that dumped in that provided the better downstream flows and once I’d passed them, the fishing was very difficult. At that point I made a decision that I’d hike back to my truck and see if I could find a second tributary to fish for the evening. There’s no trail along Irwin run so the walk out was long and hot. Once I arrived back at my truck I was greeted by a huge group of tubers and kayakers. For some reason they’d decided to park their trucks right behind 5 vehicles and essentially trap them in the lot. I ended up having to wait thirty minutes to leave and I felt I was losing valuable fishing time. After I was freed from the lot, I decided to head north on Hallton-Spring Creek Road, which parallels the Clarion River. I’d seen several blue line tributaries on Google Maps and was hoping I could find one with water. Along the way I passed Elliot Run, Painter Run, Church Run, and Cline Run. Not one of these streams appeared to have enough water to fish. At one point I came upon a couple that had wrecked on their motorcycle. I stopped to see if they were ok and the woman was pretty beat up. She had road burn on her face. Her husband was trying to pull his Harley-Davidson out of a ditch. They said they were ok and appeared to have had a few too many beers to drink. What a scene. This stretch of road attracts a lot of summer campers who set-up along the riverbanks and in the woods along the road. I ended up driving all the way to Clarington and then headed north on Rt. 899. At one point I had pulled off the road to look at Google Maps and I was so focused on my screen I didn’t realize a Pennsylvania State Trooper had pulled up next to me. Startled, I looked over and he asked if everything was good, and I said I was fine. I told him I was looking for a back-up brook trout stream and I don’t think he knew what I was talking about. By the time I reached the small town of Marienville, it was late afternoon. I pulled into a gas station and was finally able to get a strong phone signal. I decided it was critical that I find water so I looked for the largest bodies of water that were close to me. There were two, the Tionesta Creek and the South Branch Tionesta Creek. 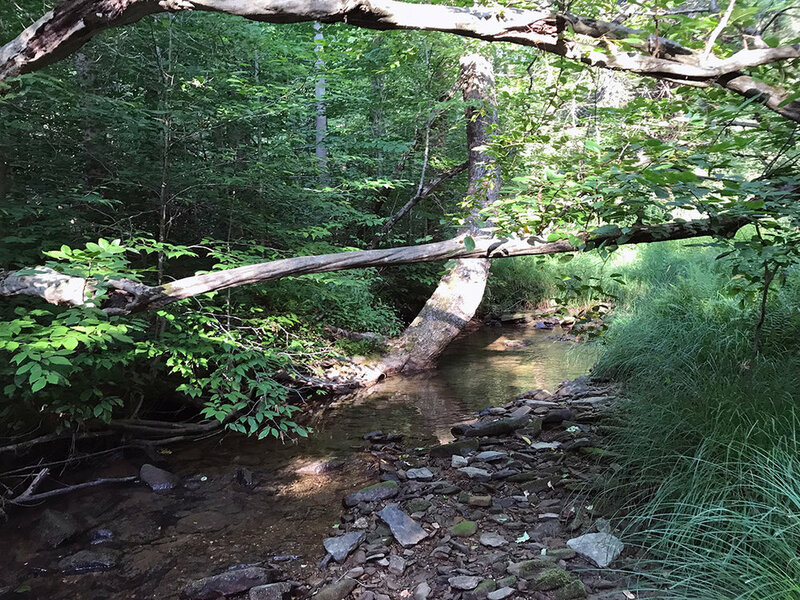 The South Branch was much closer and with limited time, I started searching for tributaries while running them against the Pennsylvania’s wild trout list. I ended up finding a wild trout tributary called Tuttle Run that was only a short drive. I headed there and when I reached my GPS target, I could not find the stream. I pulled off at a gas well and got out and looked around. I don’t know if lower Tuttle Run had dried out or if it was hidden in heavy brush and cover. Either way, I never found Tuttle Run. At this point I had no other options. It was much later in the day than I’d wanted to fish and I was tired of running around. I drove a couple miles down the road and turned right onto a dirt road to make a U-turn. I noticed a small bridge and a pull off for campers. I drove to the bridge and looked down the South Branch of the Tionesta. I saw there was a small creek dumping in further downstream. I drove further and saw that this stream wrapped back into the woods. I made a right and followed this tributary which I later found out was Cherry Run. The first spot I cast my fly line on Cherry Run. I pulled off at an old gas well, grabbed my rod, threw my waders back on and headed down the hillside toward the creek through the woods. I hit a hiking trail about half way down marked with blue paint. I walked this trail down to the water and was happy to find low cool flows, but flows that would definitely keep brookies through the summer. I only had a couple of hours of daylight left and I intended to make the most of it. I walked upstream stepping over moss-covered rocks and eventually I found a beautiful pool of water with a large tree and root system on the left side. I knelt down and placed a cast towards the back of the pool. When you cast a large dry fly on a glassy pool, sometimes there a few seconds where you hold your breath, waiting to see of a brookie will break the surface. In this case a full second passed and then the splash. This fish headed for the root system and just like that he was off and I was left pulling my fly out of a tree root. 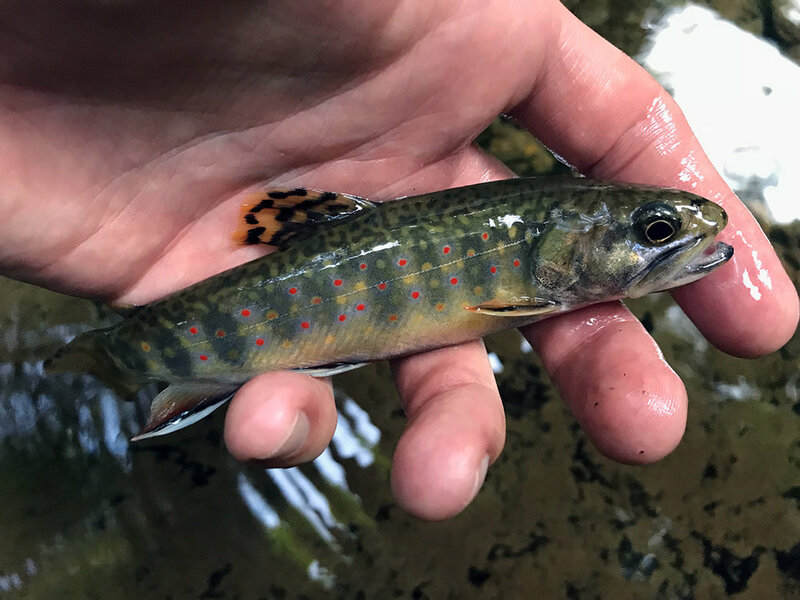 A beautiful Cherry Run native brook trout. This stream held some beautiful water and I was able to quickly catch several wild brook trout. In all my haste to catch some fish before sundown, I didn’t realize I’d hiked over a mile and half upstream. I came into an open area where the forest floor was covered with a thick bed of ferns. I made my way through and back into the water. I saw an area with good water depth that looked like it would hold a fish. I used a bow and arrow cast to place my fly in a prime lie and suddenly a good-sized brook trout inhaled my fly. This fish was easily the best fight of the day and it took me a few seconds to land it. This brook trout had fairly sizable teeth for a small fish. He had literally inhaled the fly into the back of his mouth. Fortunately with some delicate removal I was able to get him back in the water safely. It was an amazing fish to catch at that moment. Another jewel from Cherry Run. I walked another 100 yards upstream and felt I had better start making my way back. I rarely get concerned being so far back in the woods by myself but this time was different. I knew how large the forest was that surrounded me so I packed up and headed back down the hiking trail I’d found. The daylight was fading quickly. When you walk the water upstream and then walk a trail back downstream it can be tough to judge distance. At one point I thought I’d found the trail I’d come down over the hill on to access the stream. After walking up the hill I came out onto an old gas well landing. I thought for sure my truck was up there. I headed back into the woods, found the trail again and kept walking. Fortunately I was able to match up the sound of an air compressor on a gas well with where I’d come in and eventually found my truck. I was hot and exhausted and was sweating so much I needed to change my t-shirt. I sat in my truck with the AC running for ten or fifteen minutes. After I’d cooled off and drank a half-gallon of water, I decided to turn around and head back out of the forest and make the long trek home.